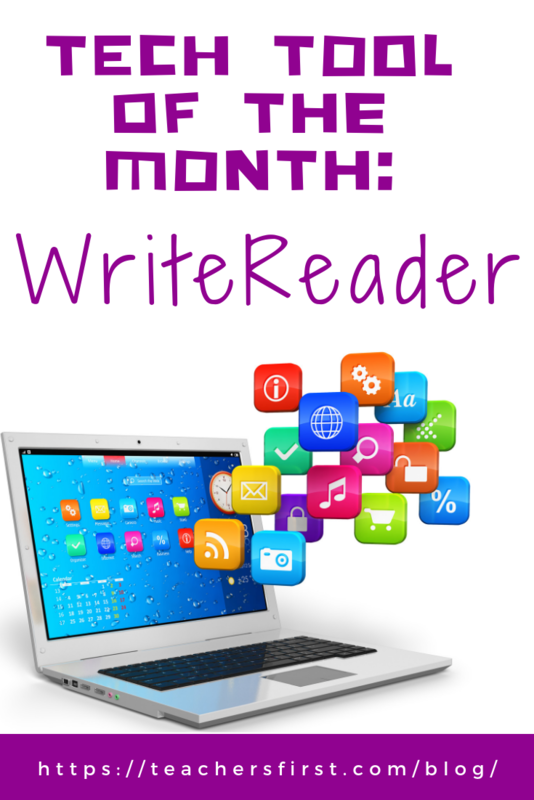 In honor of World Storytelling Day (celebrated on March 20th), the tech tool of the month for March is WriteReader. If you aren’t familiar with World Storytelling Day, it is a global celebration of oral storytelling! On this day, people are encouraged to tell and listen to stories in as many languages as possible (and at as many places as possible). WriteReader is ideal for younger students (grades K-5). Scientific research has shown that children develop and improve their reading skills by writing. This digital storytelling tool allows students to do both! WriteReader allows young students to create their own books. The tool is very simple to use, so children can use it after minimal adult guidance. Writers can add their own images, type the text, draw, add (or delete) multiple pages, and even add video recordings. But the game-changer for this tool is the adult/teacher space on each page, under the students’ writing section. This area allows the teacher to make any necessary corrections and/or comments – this tool is ideal for allowing students to practice kid writing, with less concern about proper spelling. Educators can use the added space on each page to show students the correct spellings of unfamiliar words, make comments to the students, and add additional information. Learn more about how to use this tool by viewing the short introductory video. WriteReader offers some additional unique features. There are several languages available (US English, UK English, Swedish, and Danish). Once registered (email or Google account required), teachers can access a downloadable Teacher’s Guide, lesson plans, and a letter to introduce parents to WriteReader. Adding a class and students is very simple. Click “Add a class…” and enter students names manually or give your students the code to join a class themselves. Share how to work this tech tool by demonstration using your interactive whiteboard or a projector. Explain (and show) how to join the class, add pages, use the voice-over, add images or drawings, include color, view a single page or the entire book, and more. Students can use this tool to create stories about topics learned about in science or social studies. Since students can add their own drawings, they could use the tool to solve math problems, and teachers could use the adult writing area to respond/assess the students’ understanding. WriteReader is a great tool for ESL/ELL students (and emergent readers) to hear letter sounds as they are building confidence in reading and language skills. Use WriteReader the first week of school for students to create an introduction of themselves or explain how they spent their summer. Creating a book is a great culminating activity after a literature unit/book. Students could also use this tool in language arts to practice writing sentences (with illustrations), to share poetry, to demonstrate an understanding of parts of speech, or to practice weekly spelling or vocabulary words. World Storytelling Day (or any day) is a great time to include WriteReader in your daily plans. As you can see, WriteReader is truly a great way to get students “writing to read.” Consider the ways that you could use this tool in your classroom. For additional information about the tool and even more classroom use ideas, see the TeachersFirst review for WriteReader.